Pull-ups are a highly effective exercise that works a whole host of muscle groups, including the latissimus dorsi (the “wing” muscles on your back), biceps, traps, pecs, and forearms. Better still, they can be done anywhere there’s a place to hang from. You can buy a pull-up bar that fits in your doorframe for $30. If you don’t have access to that, monkey bars or even a tree limb at a park will work. What if you’re in a hotel? If the doorframe is wide enough, you could do some pull-ups from there — though, they’ll be more like finger pull-ups. Prison? I’m sure you can find a bar somewhere to use. There are lots of bars in there, I hear, though I guess more of the vertical than horizontal variety. Just like the push-up, pull-ups can be modified to work different muscles groups or to make the exercise more difficult. Chin-up. Shift your hand into a chin-up position, and you’ll work your biceps more and train your lats in a different way. One hand grips the bar overhand and the other underhand. You may remember Rocky doing these babies during his epic training montage. Take an underhand grip with one hand and an overhand grip with the other. Pull your head to one side of the bar for one rep, and then to the other side of the bar on the next rep.
Narrow/Wide Grip. You can adjust your grip width to focus on different muscle groups. 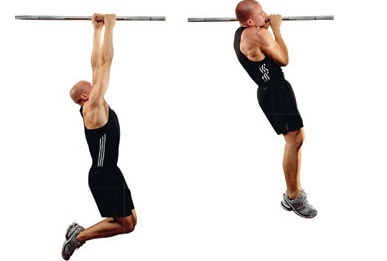 Try doing pull-ups with your hands right next to each other or as far apart from each other as you can. Hang two towels from your bar and grip one in each hand. Pull yourself up. Great for grip strength. Typewriter Pull-up. 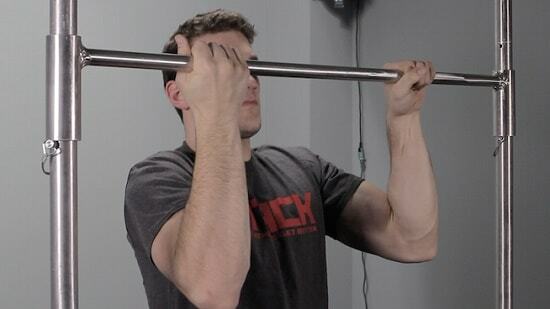 Grab the bar with an overhand grip slightly wider than shoulder-width apart. Pull yourself up until your sternum is at the bar. Now, move your body toward one hand, taking some of the weight off the opposite hand. Keep your sternum at the bar. Return your body to the center and repeat on the opposite side. Return to the center and lower your body under control. That is one rep.
One-handed Pull-up. 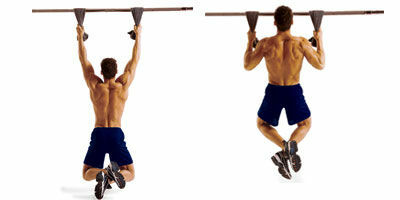 You’ll have achieved top-dog, alpha-male-prisoner, beast-mode status when you can perform multiple one-handed pull-ups.